I have hiked many times on day hikes. I think about doing long distance hikes over a number of days, but I have often worried about taking care of the water issue. You can't really carry all the gallons of water a normal person would need in a week for drinking and food preparation. 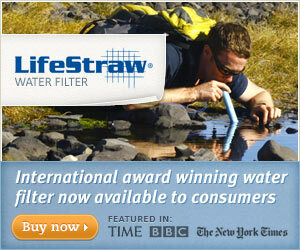 But, imagine if all you are packing is a lightweight water bottle and a LifeStraw Personal Water Filter. The weight issue is solved. 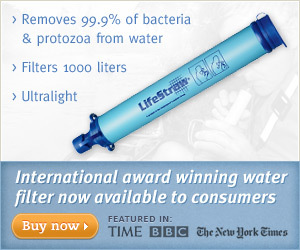 This can be used by the millions of people throughout the world that don't have access to clean water, which makes this product a brilliant invention. It will be especially useful during a natural emergency where the government tells you the water isn't safe because it hasn't been processed. When a hurricane blows through a region, a tornado levels an area or during a severe earthquake when the infrastructure deteriorates, then bring out your LifeStraw and you can drink out of a muddy lake, creek or river. I suppose self-proclaimed survivalists will find it a must have product. I saw a couple of videos of people testing the product in murky water and dirty water and they raved about the cleanness of the water and the good taste. This product was voted "Best Invention of 2005" by Time Magazine. You can get more information about the product by clicking on one of the two ads below.